Rescuers helped evacuate an injured man from a fishing vessel in Portsmouth Harbour on Tuesday evening. UK Coastguard tasked Gosport & Fareham Inshore Rescue Service to assist the man, who had fallen and injured his hip, at around 2230. The MOD police RIB was alongside the casualty vessel, which was moored in Brick Kiln Lake, near Whale Island, when GAFIRS arrived and the crews worked together to evacuate the man. 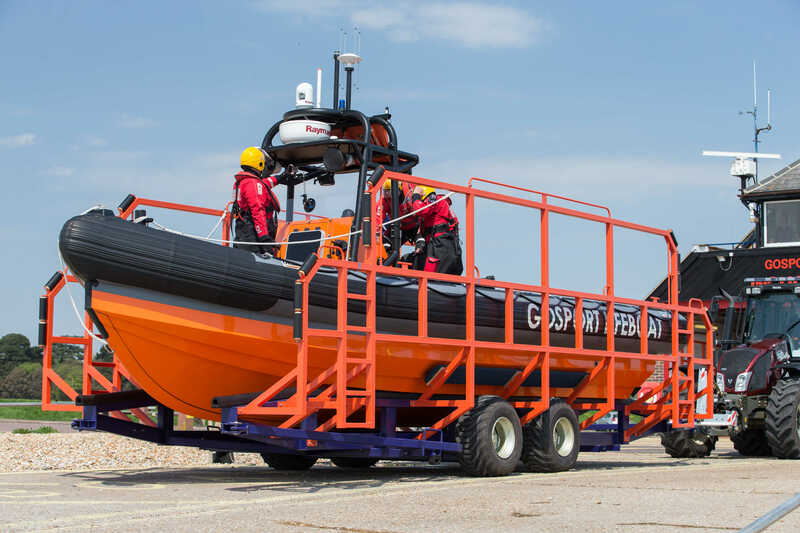 A guardrail had to be removed from the 24ft craft before the man could be placed on Gosport independent lifeboat using the service’s basket stretcher. GAFIRS coxswain Mike Allen said: ‘Despite the very confined space on the fishing boat, four of my crew, aided by two MOD police officers, were able to transfer the casualty from his boat onto our lifeboat by stretcher. In total the rescue operation lasted around three hours and was Gosport & Fareham Inshore Recuse Services’ 84th of the year – and the fifth rescue in the last six days. On Monday, GAFIRS helped evacuate a woman from Spitbank Fort into the Coastguard Rescue Helicopter after she’d sustained a serious head injury, has helped bring two broken down vessels back to port and helped search for a missing woman.